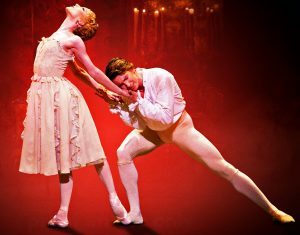 KENNETH MacMillan’s tragic and romantic ballet Manon will be broadcast live at various cinemas, including the Ambassadors, Woking, on Tuesday 3 May at 7.15pm. Manon depicts the powerful and obsessive love between Des Grieux (Vadim Muntagirov) and Manon (Sarah Lamb). The dramatic story moves from Paris to New Orleans to Louisiana with twists and turns as the lovers suffer a series of traumatic events from which they seek to escape. The ballet was choreographed by Kenneth MacMillan, who took inspiration from the bestselling novel by the 18th-century writer Abbé Prévost. The score is made up of music by Massenet, including his famous Elégie as the theme for the lovers. Manon lasts about 2 hours 35 minutes and includes two intervals.